Only 1 out of 10,000 diamonds is a natural colored diamond and the demand continues to rise at unprecedented rates. Supply however is exceedingly limited and all diamonds will be further impacted with Australia's Ellendale Mine, which produces over 50% of the world's yellow diamonds, suspending operations in mid 2015 and the impeding Argyle Mine closure in 2020. Argyle produces the world's most valuable Pink, Red, Champagne Cognac, Pink Champagne & Brownish Orangey Pink, Pink Rose, Purplish Pink, Pink Purple and Blue Violet Diamonds! As part of our premiere IGYSL Collection, this ring features a beautiful Australian, 100% all natural colored Argyle Fancy Intense Pinkish Purple Diamond center stone. It is a .21ct, pear modified brilliant, SI1 clarity, even color, measuring 4.72mm x 3.68mm x 1.62mm. It comes with a GIA certification (#GIA2165522715). The attached photos are untouched and at 20-60x. This is great quality and an excellent approach to provide a "safe haven" for your money. When you buy an Argyle Diamond, you're not only buying the highest quality, you are buying a diamond that is mined and manufactured in a socially and environmentally responsible way. This ring is sold out. Please inquire about special an order. My pear shaped purple diamond ring is soooo beautiful. And exactly what I was looking for. For my 25 th wedding anniversary .the semi mount of the ring is like nothing I have ever seen before. 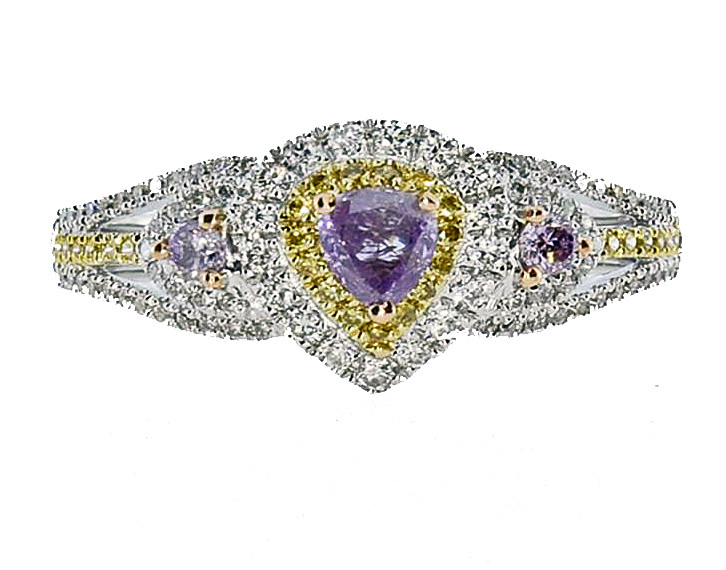 You have a beautiful purple diamond in the center surrounded by eye catching yellow diamonds also Snow White diamonds but the pink diamonds on each side of the center stone really make it pop. Also Tammy. The greatest woman on this planet. This woman bent over backwards for me in every way. I'll never be able to thank her and her company enough. Also I'm very picky about my jewelry. They have AMAZING jewelry at more than AMAZING prices. Give them a try. You won't be disappointed and I know you'll be a customer for life like I'll be. Click the button below to add the Pear Fancy Intense Pinkish Purple Cocktail Ring - New Collection to your wish list.